Dolly will provide harmonies on Martina McBride's cover of the Johnny Cash classic "I Still Miss Someone," from her new cover album, Timeless, set to drop Oct. 18, RCA Records announced in a press release Friday. Dolly herself had previously covered the song on her Grammy-winning bluegrass disc, The Grass Is Blue, back in 1999, and in another coincidence, McBride's disc of remakes will hit stores one week after Dolly's own CD of cover songs, Those Were The Days. McBride's album will include "You Ain't Woman Enough," "Make The World Go Away," "Let It Be Me," "Help Me Make It Through The Night" and its first single, "Rose Garden," among other tracks. Read the press release here and see a story on CMT.com here. Dolly's cover of "Thank God I'm A Country Boy" with Roy Rivers returns to the top spot this week on the European CMA country singles chart, it was announced Friday. The song had previously spent four weeks at No. 1 before slipping to No. 4 and No. 2 for several weeks. It rises one to recapture the pole position. In individual nations, the duet remains at No. 1 for country airplay in Italy and slips three spots to No. 17 in Germany. It falls back out of the top 20 in Demark, down from No. 10; France, down from No. 15; and Spain, down from No. 17. Get the CD here! Also, "Viva Las Vegas" by Dolly and The Grascals falls out of the top 20 in Germany, down from No. 9 last week, the song's sole week on the chart. Officials at The Chicago Theatre confirmed to Dollymania on Friday that the venue will, in fact, offer a pre-sale for Dolly's Oct. 28 engagement in The Windy City. A spokesperson said while the exact date has yet to be set, the pre-sale generally begins three-to-five days prior to tickets going on sale to the general public. The only catch is you have to join the theatre's Insider membership group, dues for which are $75 per year. Members will receive an e-mail notifying them of the pre-sale about 24 hours before tickets become available, but the venue promises its members receive the best possible seats and don't have to pay the additional transaction and convenience fees charged by ticket outlets such as Ticketmaster. In addition, members receive discounts at several area restaurants and businesses. Click here for information on membership. Thanks! In related news, House of Blues, the tour's promoter, has added a page dedicated to Dolly's "Vintage Tour" here, although it only lists the dates for which ticket sale information has been announced already and, thus, is missing several stops on the schedule at this time. Jessica Simpson just can't stop talking about Dolly. The Dukes diva this week has yet another interview promoting her new film in which she praises Parton. Asked by Buffalo, N.Y., paper altpress to name her role model whose career excites her, she answered without hesitation: "Dolly Parton. I admire her as a woman, as an entertainer, and as a personality." Read the full story here. Dollywood's Splash Country, Dolly's water park adjacent to her theme park in Pigeon Forge, Tenn., announced Thursday it will add its tallest, fastest ride ever for the 2006 season. Fire Tower Falls will contain two 70-foot-tall free-fall speed slides on the Mountain Waves wave pool deck, the park revealed. Each side will feature a 280-foot-long track which swifts riders through treetops down to the end by the Bear Mountain Fire Tower which opened earlier this year. Construction is slated to begin in October. Dollywood's Splash Country, currently in its fourth season of operation, opens each May and closes for the year in September. After 29 weeks on the country singles sales chart, "Viva Las Vegas" by Dolly and The Grascals falls out of the Aug. 6 10-position list, down from No. 7 the previous week, it was announced Thursday. However, I would expect the song to return following next week's performance of it on ABC's CMA Music Festival special. On the bluegrass albums chart, Ralph Stanley's Shine On, and its Dolly-composed title track, loses two places to No. 13 in its seventh week, while Rhonda Vincent's Ragin' Live, featuring a live cover of "Jolene," drops three notches to No. 6 in its 19th chart week. The Very Best of Emmylou Harris: Heartaches and Highways, which includes Dolly on one track, debuts at No. 23 country, No. 133 pop, No. 146 comprehensive and No. 19 Canadian country. Sandra Bullock's Miss Congeniality 2: Armed And Fabulous, with its Dolly cameo, loses one to No. 21 for the full screen version and 10 digits to No. 32 for the widescreen version in its fourth week on the DVD sales chart, and it slips two to No. 5 on the rental chart. Toby Keith's Honkytonk University gains two to recapture the No. 1 country albums spot in its 10th week and rises three to No. 15 pop, while Feels Like Today remains steady at No. 2 country and inches down to No. 16 pop in its 43rd week. The American Idol finalists' cover of the former Dolly and Julio Iglesias duet "When You Tell Me That You Love Me" loses two places to No. 9 on the pop singles sales chart in its 15th week. Randy Kohrs' CD I'm Torn, which contains the Dolly duet "It Looked Good On Paper," drops out of the top 15 bluegrass albums chart for August released by Bluegrass Unlimited on Thursday, down from No. 11 in July, and the single "Paper" falls out of the 30-position singles chart, down from No. 25 in July. 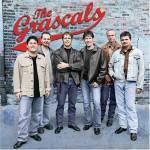 The CD The Grascals, featuring Dolly on the band's cover of "Viva Las Vegas," gains two spots to No. 3 for the month, while "Vegas" sees a three-point improvement to No. 13. The issue also features a review of Darrell Webb's new CD, Behind The Scenes, which features Dolly. The review notes: "Dolly Parton's interesting 'Cold,' on which she's the featured vocalist, reinforces her reputation as a fine bluegrass talent." Read the full review here. Officials in Cleveland County, N.C., are hard at work raising the local share necessary to kick off Dolly's Imagination Library literacy program, The Shelby Star reports here this week. The effort there is headed up by the Cleveland County Partnership for Children. Dolly's program provides one free, hardcover, age-appropriate book per month for every child birth to age 5 whose parents sign up in a participating community. Local sponsors cover the book purchase and postage costs of approximately $27 per child annually, while the Dollywood Foundation takes care of the administrative expenses. The program distributes more than 2.2 million books each year in more than 500 communities across 40 states. Fellow blonde bombshell Jessica Simpson continues to express her adoration for Dolly. In an interview with VH1.com here, Simpson said she hopes the expansion of her career into film helps her follow in Dolly's footsteps, explaining: "My mentors are Goldie Hawn and Dolly Parton. Dolly Parton is my absolute favorite because she's an amazing blonde, a great Southern lady, and an amazing songwriter/singer. She has her own theme park! She has a legacy, and I hope to be doing the same thing as her." Interestingly, Dolly was originally asked to play a supporting role in Simpson's film debut, The Dukes Of Hazzard, but turned down the part of Willie Nelson's character's girlfriend, which ended up being played by former "Wonder Woman" Lynda Carter. CMT.com reported Thursday night that former Goldband Records owner Eddie Shuler died Saturday in Atlanta and funeral services were held Lake Charles, La., on Wednesday. He was 92. Shuler's label was the first to record Dolly, when she laid down her songs "Puppy Love" and "Girl Left Alone" at the Lake Charles studio at the age of 11 in 1957. Shuler released the 45 as a single two years later. Dolly recounted in her 1994 autobiography, Dolly: My Life and Other Unfinished Business , that Shuler's son, Johnny, whom she met at that recording session, was her "first real love." Read a longer article on Shuler's passing from New Orleans music magazine OffBeat here. Dolly pals, backing band and opening act from last year's tour, The Grascals, have been nominated to play the first-ever Nashville Scene Music Festival. The alternative weekly newspaper is asking readers to vote for the bands they want to hear perform. In the bluegrass category, The Grascals are up against Melonie Cannon, Old Crow Medicine Show, Harley Allen and Alecia Nugent. In their description, the paper noted Dolly's choice to work with them and said they are "an ensemble of unsurpassed cohesion and focused artistic direction." Read the band descriptions here and cast your vote here. Ballots will be accepted through Aug. 17, and the nominees in each category have agreed they are available to play the Sept. 24 concert if selected as the winners. The band's current single, "Viva Las Vegas," is a duet with Dolly, a concert performance of which will be seen on ABC Aug. 2 as part of the CMA Music Festival: Country Music's Biggest Party special. Image at left courtesy The Grascals. Talk of a possible sequel to Dolly's blockbuster film 9 To 5 with Jane Fonda and Lily Tomlin was in the news again this week following publication Tuesday of a story in the British tabloid The Sun which quoted Fonda saying they would "love" to make another film, joking that it should be called "24/7." The actress, who recently came out of retirement, said they have yet to find a suitable script for the project but added it would be "fun" to learn how the characters from the original film have progressed over the decades since its initial release. Dolly was quoted repeating the joke she's made in the past that they need to hurry up and film it before they become "the good, the bad and the ugly." The actresses discussed a sequel off and on for several years in the 1980s before Fonda went into retirement. They rekindled the talk when they reunited for a charity screening of the film two years ago. More recently, both Fonda and Tomlin have mentioned in interviews that a sequel is "not out of the question" if they find a good script. Read the story from The Sun, which was repeated on several entertainment Web sites throughout the day, here. Children's author/illustrator Keiko Kasza will make her way to Dollywood a week from Saturday to sign copies of her story My Lucky Day, one of three books used for the live-action stage musicals in the park's KidsFest production Dolly's Imagination Playhouse, each of which features a new song written by Dolly. The park announced Tuesday that Kasza will autograph her book following both performances of the show, at 1:15 p.m. and 5:15 p.m., on Aug. 6. The shows continue through Aug. 7, when the third annual KidsFest comes to a close. The Bradley News Weekly in Bradley County, Tenn., this week updates its local efforts in Dolly's Imagination Library national literacy program, saying nearly 700 children have signed up for the free monthly book program since it kicked off there four months ago. Read more here. Sugar Hill Records confirms Dolly's upcoming CD, Those Were The Days, has been scheduled for an Oct. 11 release. The disc, expected to consist of Dolly's interpretations of many of the classics of the folk-rock era such as "Imagine" and "Crimson and Clover," will feature a slew of guest vocalists ranging from Keith Urban to Norah Jones. Word has it more details about the project could be released in the next week or two, so keep checking back! Dollywood officials confirm that her four concerts at the park in September are now all sold out. The two on Sept. 24 had been sold out for quite a while now, but a handful of tickets had remained available for the two shows on Sept. 25 for several weeks. The last of those were apparently sold on Monday morning. However, each year fans who are unable to attend turn in tickets for the charity benefit concerts to be re-sold, so anyone without seats who wishes to attend may call 1-800-Dollywood periodically between now and the concerts to see if any have become available. Also, although her upcoming tour's promoters, House of Blues Concerts, have been touting this fall's concerts as the "Those Were The Days" Tour, I've confirmed it is actually to be called "The Vintage Tour," the name it had previously been given. Thanks! Could there be a new Annie Leibovitz photo in Dolly's future? Well, we don't know yet, but it might be possible. CMT.com columnist Hazel Smith reported Monday that Dolly met with the famed rock 'n' roll shutterbug along with actress (and major Dolly fan) Reese Witherspoon on Wednesday while Leibovitz was shooting Witherspoon at Johnny Cash's former estate northeast of Nashville for a fall Vogue spread to promote the upcoming film Walk The Line, the Cash bio-pic which stars Witherspoon as June Carter Cash. Smith said she doesn't know why Dolly met with the two, but Liebovitz has in the past taken some of Dolly's most stunning photographs, including her famous poses with a young Arnold Schwarzenegger in the late 1970s, her Rainbow CD cover art, a mid-'90s Vanity Fair cover spread and her Halos & Horns CD art. Read Smith's column here. Ever want to know more about the kind face that greets you when you enter Dolly's museum at Dollywood? Well, The Mountain Press in neighboring Sevierville, Tenn., over the weekend profiled museum greeter Helen Edmison, who has worked at the park for 19 years and says she loves meeting the great variety of people from all over the world who pass through the building's doors daily. Read the cute story here. The paper also has a great article about the benefits senior citizens receive by working at the park. Read it here. The official Pigeon Forge tourism department's Visitor's Center, specifically its welcome film which features Dolly, is spotlighted in Monday's Knoxville News-Sentinel. Read the story here. Richmond.com reported Monday that Country Music: The Spirit of America, an IMAX film from a couple of years ago which also goes by the name Our Country and features Dolly singing "Turn, Turn, Turn," has opened at the Science Museum of Virginia's Ethyl IMAX Dome and will play there through Sept. 30. Read more here. Aug. 18, New York (Ticketmaster): The main orchestra (floor) seating is nearly completely sold out (with only a few seats on the back row in the center and a few back rows on far sides remaining). Each of the three mezzanine levels appears to be about half sold out as well. Aug. 20, Philadelphia (Tickets.com): The venue features five levels: Pit, Orchestra A, Balcony Boxes, Orchestra B and Circle (the furthest back). The pit has been sold out for some time, while Orchestra A now only has a handful of seats in the back one or two rows left. Orchestra B appears to be about half sold out. Aug. 23, Washington, D.C. (Ticketmaster): The floor is about three-quarters sold out, box seating is about half sold out, and plenty of seats are left in the raised tier level. Tickets went on sale here on Friday. Aug. 27, Halifax (venue's box office): Tickets went on sale here Saturday, and there are still quite a few seats toward the back of the floor and a good number in the lower raised section as well. Aug. 31, Ottawa (Capital Tickets): The floor is about half sold out with plenty remaining in the raised tiers. Sept. 1, Toronto (Ticketmaster): The first level is sold out and second level has only a few seats remaining on the back row. The third level is about half sold out, but very few seats have been sold yet in the fourth tier. As tickets for the Aug. 28 stop in St. John are by phone only and those for the tour's kick-off on Aug. 16 in Atlantic City (via Ticketmaster) are general admission, I don't know how well those are selling. Ticket sale dates for the other known stops on the tour -- Sept. 30 in Los Angeles and Oct. 1 in Las Vegas -- have yet to be announced, and additional dates are expected to be coming soon. The Cleveland Daily Banner in Polk County, Tenn., over the weekend updated readers on the progress of Dolly's Imagination Library national literacy program's local chapter, saying nearly a quarter of eligible children have signed up for the project in its first six months of operation there. Nationwide, Dolly's program provides more than 2 million free books annually to children from birth to age 5 who live in the more than 500 participating communities. Read more here. I'm told Dolly gets a mention in the U.K. publication Gay Times for August. A "Guilty Pleasures" column of things a lot of people love but sometimes have a hard time admitting (such as The Dukes Of Hazzard or televised wrestling) includes Dolly. It notes that many folks won't admit it, but "everyone wants to go to Dollywood" and praises her "feel-good" movies, music and more. Thanks, Joe! After a brief one-week re-appearance on the chart Down Under, Norah Jones' Feels Like Home, with Dolly on the duet "Creepin' In," falls back out of the 50-position Australian pop albums chart, it was announced Sunday, down from No. 43 the previous week. Paisley: Dolly Makes Him 'Cool,' Twice! Dolly will appear on a second track of Brad Paisley's upcoming CD, Time Well Wasted, it was revealed Friday. In addition to her previously-announced vocals on the song "Where I Get Where I'm Going," Dolly and James Burton joined in with Paisley's Kung Pao Buckaroos for a comedy skit titled "Cornography." The Buckaroos, consisting of Bill Anderson, Little Jimmy Dickens and George Jones, last appeared in a hidden bonus track on Paisley's 2003 CD Mud On The Tires. About Dolly's appearance, Paisley said in a press release issued Friday: "Hearing Dolly sing is like Coca-Cola - when you hear her voice you know it's her just like you know when you drink Coke - it doesn't taste like RC or Dr. Pepper - it's Coke. It's Dolly. When I hear myself singing with her, any insecurity or illegitimacy I feel goes away - because you know, I must be cool if I'm in the same speaker with Dolly." The disc, available here, hits stores Aug. 16. Thanks, Darlene! Don't forget that tickets go on sale Saturday morning for Dolly's "VintageTour" stops on Aug. 27 in Halifax and Aug. 28 in St. John and her 21-and-up Aug. 19 Mohegan Sun Casino show in Connecticut. The Halifax seats will be sold via the venue's Web site here, while the St. John date will be for sale only in person and by phone (506-657-1234 or 1-800-267-2800). The Mohegan Sun show will be sold on Ticketmaster. Tickets went on sale Friday morning at Ticketmaster for her Aug. 23 engagement at the DAR Constitution Hall in D.C., and almost immediately Dollymania began hearing complaints from readers who had bought tickets as soon as they went on sale but couldn't get any closer than 12-15 rows back. The tour's promoter, House of Blues, didn't respond to an inquiry on sales by the time of this update Friday night, but shortly after seats became available some on the second, third and fourth rows started showing up on eBay stores operated by "ticket brokers." These modern, tech-savvy scalpers buy up many of the best seats at most concerts in major cities the moment they go on sale by using dozens and dozens workers who purchase the maximum number of tickets allowed. Then they sell them for many times their face value in auctions or set-price sales. So it appears these brokers, about whom most tour promoters have complained more and more in recent years, appear to at least be partially to blame for the lack of prime floor seats. In addition to the Washington show, tickets remain on sale at Ticketmaster for Aug. 16 in Atlantic City, Aug. 18 in New York and Sept. 1 in Toronto, at Capital Tickets for the Aug. 31 concert in Ottawa and at Tickets.com for Aug. 20 in Philadelphia. I'm told that not only is Dolly in the list of preliminary nominees for this year's International Bluegrass Music Association (IBMA) awards show for Song of the Year with The Grascals on "Viva Las Vegas," but she also has a preliminary nod for Best Female Vocalist, an award for which she was nominated in 2000 and 2001. Final nominees will be announced around Sept. 1. Thanks, Tony! Wanna breakfast with some of the zany children's characters at Dollywood for KidsFest? Well, the park has announced a children's character breakfast for Aug. 5 at 8:45 a.m. Reservations are required at 1-800-Dollywood by Aug. 3, and ticket prices are $8.75 for adults, $4.37 for kids ages 4-11 and free for kids 3 and under. KidsFest, which concludes Aug. 7, is one of the largest children's festivals in the nation. The seven-week event features Dolly's Imagination Playhouse, the Clifford the Big Red Dog stage show, the world premiere of the cartoon VeggieTales' Minnesota Cuke & the Search for Sampson's Hairbrush, MGM Mad Science Movie Magic, a SpongeBob SquarePants turbo action ride, the ASA Extreme Sports team and more. You might not expect hip-hop/R&B diva Faith Evans to cite Dolly as a muse, but she has. In writing her current CD, The First Lady, which came out earlier this year, she listened to albums by Dolly and Waylon Jennings for inspiration, she told The New York Daily News in a story re-printed this week in The Orlando Sentinel here. "I like how country writers aren't afraid to be honest, to tell their stories," she explained. "Blues Man," Dolly's duet with George Jones on his upcoming CD Hits I Missed . . . And One I Didn't, will be shipped as a single to radio early next month in advance of the album's Sept. 13 release, according to the president of his personal label, Bandit Records. Evelyn Shriver, Bandit president, tells Dollymania that the August single should see some airplay but doesn't hold out hope for the track to become a hit. "The reality is the 'reporting' radio stations may not play it," she explained. "Firstly they consider George and Dolly legends and they don't really play their new stuff and both artists are on labels that they own which are not capable of 'marketing' partnerships with radio conglomerates." She said they expect "a lot of airplay and attention" but not enough for it to rise up the country singles charts. Fan site Voice Of An Angel first reported on Wednesday that the duo will film a video for release with the single, and Shriver confirms this is correct. The disc will be distributed to music stores across the nation via Sugar Hill Records/Welk Music, the same label which distributes Dolly's Blue Eye Records imprint. Reserve your copy here. Sandra Bullock's Miss Congeniality 2: Armed And Fabulous DVD release, featuring a hilarious Dolly cameo, continues to slide on the video sales charts, according to the July 30 tallies released Thursday by Billboard. In its third week, the full screen version of the DVD tumbles a dozen places to No. 20 for sales while the widescreen version drops eight spots to No. 22. On the rental side, it dips two notches to No. 5. On the country singles sales chart, Dolly's cover of "Viva Las Vegas" with The Grascals rebounds one digit to No. 7 in its 29th week. The bluegrass albums chart sees Ralph Stanley's gospel CD, Shine On, featuring a Dolly-written title song, fall four to No. 11 in its sixth week, while Rhonda Vincent's Ragin' Live, with her cover of "Jolene," remains steady at No. 3 in its 18th chart week. George Strait's Somewhere Down in Texas remains steady at No. 1 country but drops four to No. 10 pop in its third week on sales of 59,000 units, while Feels Like Today, which happens to feature one of the band members donning a Dolly t-shirt on its cover, inches up one to No. 2 country and slips one to No. 16 pop in its 42nd week. The American Idol finalists' cover of the former Dolly and Julio Iglesias duet "When You Tell Me That You Love Me" gains one to No. 7 on the pop singles sales chart in its 14th week. "Thank God I'm A Country Boy," Dolly's cover of the John Denver classic with Roy Rivers, remains steady at No. 2 in the new European CMA country singles chart released Thursday. The song had previously peaked at No. 1 for four weeks. In individual countries, the duet slips four to No. 10 for country singles airplay in Denmark, is down a dozen to No. 14 in Germany and falls out of the top 20 in Holland and Austria, down from No. 20 and No. 2, respectively. The duet returns to the top 20 in Italy at No. 1, France at No. 15 and Spain at No. 17. Get the CD here! In addition, her recording of "Viva Las Vegas" with The Grascals debuts at No. 9 for country singles airplay in Germany, the chart reports. And those aren't the only Dolly tracks getting airplay across the pond. Even though the CD originally came out two years ago this month, two songs from Dolly's Halos & Horns are on the August European Christian Country Chart released this week. Her "Raven Dove" loses three spots to No. 21 in its sixth month on the chart, while "John Daniel" sees an 11-point gain to No. 45 in its second month on the chart. Don't forget tickets for Dolly's Aug. 23 Washington, D.C., stop on the "Vintage Tour" go on sale at Ticketmaster at 10 a.m. Eastern on Friday. This will be followed by Saturday morning sale dates for her Aug. 27 Halifax and Aug. 28 St. John concerts in Canada -- via phone at (506) 657-1234 for St. John and via the venue's Web site here for Halifax -- and the Aug. 19 date in Uncasville, Conn., via Ticketmaster. Tickets remain on sale at Capital Tickets for the Aug. 31 concert in Ottawa, at Tickets.com for Aug. 20 in Philadelphia and at Ticketmaster for Aug. 16 in Atlantic City, Aug. 18 in New York and Sept. 1 in Toronto. Dolly's animal-themed Dixie Stampede dinner theatre in Pigeon Forge, Tenn., released a photo Wednesday of Dolly with a stick horse of her own creation in celebration of the restaurant's newest attraction, Dolly's Barnyard Critters, which includes the world's only build-you-own-stick-horse operation and the largest collection of stick horses on the planet. In a release, Dolly said: "Next to the magnificent animals in our show, I think these are the cutest, cuddliest critters I've ever seen. I just couldn't resist making one of my own." She named hers "Lucky." The Stampede, which features trained horses, buffalo, ostriches and more, also operates locations in Orlando, Fla., Branson, Mo., and Myrtle Beach, S.C. Photo of Dolly and Lucky at left courtesy Business Wire. Click on it for a larger version. Dolly's cover of "Viva Las Vegas" has made it into the preliminary nominations for the 16th annual International Bluegrass Music Association (IBMA) awards show, to be held Oct. 27 in Nashville. The balloting is in its second round, and the tune with The Grascals has snagged a preliminary nod for Song Of The Year, as has the track "Me And John And Paul," also from the debut CD The Grascals, the band announced on its Web site Wednesday. To earn a spot on the second ballot, each nominee for Song Of The Year must have at least 10 members of the IBMA nominate it in the first round of voting. Final nominees will be announced around Sept. 1. Dolly is no stranger to the IBMAs. The Grass Is Blue won Album Of The Year in 2000, and she also collected trophies for Recorded Event of The Year with Ralph Stanley and a slew of other performers for his CD Clinch Mountain Sweethearts in 2002 and with several artists for the tribute album Livin', Lovin', Losin': Songs Of The Louvin Brothers in 2004. She was nominated for Best Female Vocalist in 2000 and 2001 and earned a couple more multiple artist nods for the Bill Monroe tribute project, Big Mon, in 2001. The Fort Worth Weekly on Wednesday offered a positive review of the recent compilation The Essential Dolly Parton, noting that the disc "is worth buying for the songs and performances; the various hairstyles and costumes in the accompanying photographs are a bonus." Read the full review here. The Herald-News in Dayton, Tenn., reported here Wednesday on progress in Rhea County to implement Dolly's Imagination Library literacy program there, and Memphis TV station WMC also reported here Wednesday on the work to bring it to the 65,000 children from birth to age 5 in much larger Shelby County. The Defense Department on Tuesday released a transcript of an interview with Secretary of Defense Donald Rumsfeld on Nashville radio station WTN's Steve Gill Show in which Dolly gets a prominent mention. Rumsfeld shared the stage with Dolly for a few moments at her April hosting gig at The Grand Ole Opry in a salute to American troops. Asked about the appearance, he said: "Listen, that Grand Ole Opry is such a special place and the people there in that audience are such supporters of the men and women in uniform who you were visiting with over in Iraq. But Dolly Parton, when she gets up on the stage, she owns that stage. She was terrific. I was delighted to be there again." Read the full interview in a press release here. Mark Burgess, operator of longtime fan site Dolly.net, announced on his site Wednesday morning that due to health issues and other reasons he has chosen to cease its operation. We know folks will miss his site and the information and photos which it provided, and we sincerely thank him on behalf of the Dolly fan community for his many years of service and dedication. We wish him the best. House of Blues and St. John's Harbour Station on Tuesday announced the sale date for Dolly's Aug. 28 concert at the New Brunswick venue in her "Vintage Tour." Tickets, $45-$55 each, will go on sale at the Harbour Station and Imperial Theatre box offices and via phone at (506) 657-1234 or 1-800-267-2800 on Saturday, both said. The new information confirms that an earlier posting by House of Blues that the show would be free admission was incorrect. Ticket sales will begin for St. John the same day as those for her performance in nearby Halifax on Aug. 27 (at the venue box office here) and the Aug. 19 tour stop in Uncasville, Conn. (at Ticketmaster). Remember D.C.-area fans that tickets go on sale for her Aug. 23 concert there at Ticketmaster on Friday. Ticket sale dates have yet to be announced for the Sept. 30 show in Los Angeles or Oct. 1 stop in Las Vegas. As the tour is expected to feature approximately 40 cities, somewhere around 26 or 28 additional shows should be announced in coming weeks. Governor Celebrates Another Library In Tenn. The Covington Leader in Tipton County, Tenn., on Tuesday offered coverage of Gov. Phil Bredesen (D-Tenn.) launching their local chapter of Dolly's Imagination Library from Friday. "There's nothing more important to a young child than reading with them," the governor said at the ceremony. "I think it's a great program." The county became the 62nd in the state to implement the literacy program, and the newspaper reports that all but seven of the 33 remaining counties are in the planning stages to launch the project there. Read more here. The Halifax Metro Centre announced Monday that tickets for Dolly's Aug. 27 stop in the Nova Scotia city will go on sale at 9 a.m. local time Saturday. They range from $50 to $60 and will be for sale at the venue's online box office here. Thanks, Brad! The on-sale date for the Aug. 19 stop at the Mohegan Sun Arena in Uncasville, Conn., may have changed. Although House of Blues still shows it on sale on Friday, Ticketmaster now states that seats, $45-$60, will be offered starting at 10 a.m. Eastern on Saturday. To indicate the level of interest in the tour, Dolly is now the third-most-searched name in the tour section of the House of Blues Web site, according to listings published on the site. Tickets went on sale Monday at Capital Tickets for the Aug. 31 concert in Ottawa and at Ticketmaster (after a pre-sale) for the Sept. 1 Toronto performance. Tickets remain on sale at Ticketmaster for Aug. 16 in Atlantic City and Aug. 18 in New York and at Tickets.com for Aug. 20 in Philadelphia. Porter Wagoner's new temporary exhibit at the Country Music Hall of Fame in Nashville, "Porter Wagoner: The Rhinestone Troubadour," opened Friday. On Monday, an interview with him appeared on CMT.com here talking about the shiny costumes and other artifacts on display, and it includes a comment about how great it was to work with Dolly as his duet partner for more than seven years. (However, the introduction to the interview calls Dolly's recording of "Those Were The Days" as a duet with Porter when, in fact, it's a collaboration of hers with several legends of country music, including Porter, for her upcoming CD of the same title.) The exhibit remains open through January. Although House of Blues has yet to return the Aug. 28 St. John show to its listing of concerts for Dolly's "Vintage Tour," The Halifax Herald Limited reported here Saturday about that date and the Aug. 27 concert in Halifax being on the itinerary on Sugar Hill Records' Web site and said that an official announcement including ticket prices is expected to come this week. House of Blues had originally listed the St. John show as free but then removed it from its partial schedule for the tour. Don't forget tickets go on sale Monday at Capital Tickets for the Aug. 31 show in Ottawa and at Ticketmaster (after a pre-sale) for the Sept. 1 Toronto date. Tickets remain on sale at Ticketmaster for her Aug. 16 concert in Atlantic City and Aug. 18 engagement in New York and at Tickets.com for the Aug. 20 stop in Philadelphia. The Grascals, Dolly's backing band and opening act for last year's "Hello I'm Dolly" tour, have an exclusive Country Weekly interview available as a video feed from SBC, the band announced over the weekend on its Web site. The three-and-a-half minute talk centers largely around their work with Dolly. View it here by choosing the Country Weekly box and selecting "The Grascals" from its drop-down menu. Norah Jones' Feels Like Home, featuring the Grammy-nominated Dolly duet "Creepin' In," re-enters this week's Australian pop albums chart, it was announced Sunday, with the disc coming in at No. 43. It had previously peaked at No. 2. For those in Philadelphia, Pa., you may want to head out next weekend to see Shakespeare Was a Big George Jones Fan: Cowboy Jack Clement's Home Movies, a documentary featuring home movies of songwriter/producer Jack Clement. The film, which won an award when it premiered at this year's Nashville Film Festival, is being shown at the Free Library of Philadelphia at 7 p.m. Friday and features never-before-seen footage of country legends including Dolly, Johnny Cash, Jerry Lee Lewis, Jones and others. Read a note from The Philadelphia Inquirer here. According to a profile of actress/writer Kitty Stallings in Sunday's The Sun Herald in Biloxi, Miss., here, she is shopping a screenplay around Hollywood titled Tell Dolly Parton I Love Her. If produced, it is noted, the intention would be to ask Dolly to play herself in the film. Don't forget tickets go on sale to the public Saturday at Ticketmaster for her Aug. 16 concert in Atlantic City. Tickets went on sale Friday at Tickets.com for the Aug. 20 stop in Philadelphia and at Ticketmaster (after a pre-sale) for her Aug. 18 engagement at New York's Radio City Music Hall. Seats go on sale Monday at Capital Tickets for the Aug. 31 show in Ottawa and at Ticketmaster (after a pre-sale) for the Sept. 1 Toronto date. The track listing for Brad Paisley's Aug. 16 CD Time Well Wasted was released Friday, and the song which features guest vocals from Dolly is titled "When I Get Where I'm Going." The disc also features his current hit "Alcohol" as well as a duet with Alan Jackson on "Out In The Parkin' Lot." Reserve your copy here. According to The Rainbow Network the annual Stockholm Pride gay and lesbian pride festival in Sweden this August will feature a tribute to Dolly. The tribute is scheduled in Pride Park on Aug. 5. Read more here (but it's in Swedish). Tennessee's Jackson Sun on Friday profiled efforts in the Gibson County associated with its involvement in Dolly's Imagination Library literacy program. Read more here. Don't forget that tickets go on sale at 10 a.m. Friday at Tickets.com for the tour's Aug. 20 stop in Philadelphia. After a pre-sale Thursday for her Aug. 18 performance at New York's Radio City Music Hall, tickets go on sale to the public at 10 a.m. Eastern Friday at Ticketmaster. After a pre-sale Wednesday and Thursday, seats for the Aug. 16 show in Atlantic City will go on sale to the public at 10 a.m. Eastern Saturday at Ticketmaster. After a pre-sale Wednesday and Thursday, the Sept. 1 Toronto date goes on sale to the public at 10 a.m. Eastern Monday at Ticketmaster. Tickets go on sale Monday at Capital Tickets for Dolly's Aug. 31 show in Ottawa. I'm told publicity has started for at least the Toronto show, with a large half-page ad for ticket sales appearing Thursday in NOW Magazine, which is aimed largely at a young adult readership. It describes the show as Dolly "peforming her greatest hits plus selections from her new album." Thanks, Brad! The DVD of Sandra Bullock's Miss Congeniality 2: Armed And Fabulous, and its Dolly cameo, continued to do well in its second week of sales, according to the July 23 charts released Thursday by Billboard. The full screen version of the DVD slips three spots to No. 8 in sales and the widescreen version is down five places to No. 14. However, the disc remains at No. 3 for a second week in top rental selections. Elsewhere on the charts, "Viva Las Vegas" by Dolly with The Grascals inches down one to No. 8 in its 28th week on the country singles sales chart, while the CD which contains the song, The Grascals, falls back off of the 15-position bluegrass albums chart, down from No. 14 in its 14th week the previous week. Also on the bluegrass list, Ralph Stanley's gospel CD, Shine On, with its Dolly-written title track, gains another notch to No. 7 in its fifth week, and Rhonda Vincent's Ragin' Live, including a cover of "Jolene," goes back up one to No. 3 in its 17th chart week. With 91,000 copies sold, George Strait's Somewhere Down in Texas remains steady at No. 1 country but falls five to No. 6 pop in its second week, while Toby Keith's Honkytonk University remains steady at No. 2 country and drops three to No. 10 pop in its eighth week. The American Idol finalists' cover of the former Dolly and Julio Iglesias duet "When You Tell Me That You Love Me" slips two to No. 8 on the pop singles sales chart in its 13th week. Add bluegrass diva Rhonda Vincent to the list of guest stars for Dolly's October release, Those Were The Days. Vincent reported Thursday on her Web site that she spent Wednesday (which was her birthday) in the studio recording a track for the album with Dolly and previously-announced guest vocalist Judy Collins. 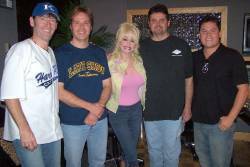 See a picture of Dolly and Rhonda with the guys in the studio here! Thanks, Tony! The Aug. 1 issue of Country Weekly on newsstands this week features a three-page photo spread of Dolly in her apartment on the grounds of Dollywood, although the images by Curtis Hilbun originally appeared in the British magazine Hello a few weeks ago. The issue also includes vocal coach Renee Grant-Williams discussing working with her favorite stars, including her gushing over Dolly, saying one never forgets being in the same room with her and that she has a wonderful warmth and "aura" about her. Don't forget that tickets for her Aug. 18 stop at New York City's Radio City Music Hall go on pre-sale for the venue's Backstage Access Club members (and also for subscribers to the Country Music Association's e-newsletter) at 9 a.m. Eastern Thursday on Ticketmaster. They go on sale to the general public on Friday. Tickets went on pre-sale Wednesday morning at the House of Blues Web site for HOB members for the Aug. 16 stop in Atlantic City and Sept. 1 performance in Toronto. Seats go on sale to the general public for those dates on Saturday and Monday, respectively. Tickets go on sale Friday at Tickets.com for the tour's Aug. 20 stop in Philadelphia. One good turn deserves another, they say, and Dolly and George Jones agree. CMT.com reported here Wednesday that Dolly will appear on Jones' upcoming covers album, Hits I Missed . . . And One I Didn't, to be released Sept. 13 on Bandit Records. The two duet on "The Blues Man," a cover of a song written by Hank Williams Jr. several years back which Alan Jackson turned into a top 40 country single in 2000. The disc will find The Possum offering his take on several country classic plus a reworking of his signature song, "He Stopped Loving Her Today." Earlier this month, Jones was among the group of country legends who lent their voices for Dolly's title track for her own upcoming cover album, Those Were The Days, to hit stores in October. The two earlier had performed together on the song "Where Grass Won't Grow" from Jones' 1994 CD Bradley Barn Sessions. Dolly's duet of "Thank God I'm A Country Boy" with Roy Rivers rebounds two spots to No. 2 in the new European CMA country singles chart, reflecting airplay through June 9. The song had peaked at No. 1 for four weeks. In individual countries, the duet returns to the top 20 for country airplay in Holland at No. 20, Denmark at No. 6, Germany at No. 2 and Austria at No. 2. Get the CD here! Dolly has added the first non-U.S. date to her upcoming tour: Sept. 1 at The Molson Amphitheatre in Toronto, Ont., Canada, House of Blues announced Tuesday. Tickets will go on sale to HOB members at 10 a.m. Eastern Wednesday and to the general public at 10 a.m. Eastern next Monday. This will be an all-ages show. Don't forget that HOB members will also get the first crack at tickets for her Aug. 16 stop at Atlantic City's House of Blues starting at 10 a.m. Eastern Wednesday as well. Those who join Radio City Music Hall's Backstage Access Club can start ordering seats for her Aug. 18 concert there at 9 a.m. Eastern Thursday. Finally, the Mann Center in Philadelphia has announced that tickets for her Aug. 20 show there will also go on sale at 10 a.m. Friday. They will run $58, $48 and $38. Dolly was pretty "rowdy" at her surprise appearance at Chris Thile's solo show in Nashville on Sunday night, Brad Schmidt of The Tennessean reported here on Tuesday. He says Dolly joked, of course, about her famous bosom as well as Thile's growing fan base, both straight and gay, giggling as she said: "The girls all love him, but the boys think he's cute, too! Are you scared or are you like me, do you take anything as a compliment?" Schmidt also revealed that Thile's band, Nickel Creek, will appear among the multitude of guest performers on Dolly's upcoming Those Were The Days CD, to be released in October. Image of Thile at left by Danny Clinch and courtesy Sugar Hill Records. If you live in a state close to Tennessee, you might start seeing Dolly on your television more often. That's because the state Tourism Development Department has received a one-time 30 percent increase in its budget to provide $4.5 million to triple the number of tourism commercials airing in several cities in bordering states, the Associated Press reported Tuesday. There are two "The Stage Is Set For You" commercials in the program: one featuring Isaac Hayes in Memphis and one featuring Dolly in Nashville. Read more here. Dolly's Imagination Library literacy program is chugging along toward getting all 95 counties in Tennessee to sign up. The Covington Leader in Tipton County, Tenn., reported Tuesday that Gov. Phil Bredesen (D-Tenn.) and local dignitaries will be present in Covington on Friday to kick off that county's addition as the 62nd in Tennessee to participate in the nationwide project. Read more here. A reader alerted me that the 2003 film Our Country, an IMAX film about country music which features Dolly leading an all-star sing-a-long of "Turn, Turn, Turn," has opened at the IMAX Theater in the Indiana State Museum in Indianapolis, Ind. The film is also currently playing at Western Fair IMAX Theatre in London, Ont., Canada; the McWane Center's John W. Woods IMAX Dome Theatre in Birmingham, Ala.; and the Henry Ford Museum IMAX Theatre in Dearborn, Mich. Thanks, Dawn! New York City's Radio City Music Hall on Monday announced Dolly's stop there on her new tour will be at 8 p.m. Aug. 18. Calling the tour the "Those Were The Days Tour" instead of the earlier "Vintage Tour" title, the venue says tickets will run $39.50-$74.50 each with an eight-ticket limit per person. They will go on pre-sale to members of the Music Hall's Backstage Access Club (join here for free) at 9 a.m. Eastern on Thursday, with sales to the general public at Ticketmaster beginning at 10 a.m. Eastern on Friday. Thanks, Christian! Ticketmaster also on Monday added a page for Dolly's Aug. 16 show at Atlantic City's House Of Blues (tickets on sale to HOB members at 10 a.m. Eastern Wednesday and to the general public via Ticketmaster at 10 a.m. Eastern on Saturday). Tickets to the Atlantic City show will run $103-$128 and will feature a six-ticket-per-household limit. Dolly will, indeed, play this year's free Hardly Strictly Bluegrass Festival in San Francisco, a spokesperson for the singer confirms to Dollymania. Dolly is scheduled to play the ticket-less concert on the grounds of Golden Gate Park on Sunday, Oct. 2, the second day of the two-day event. As was noted here previously, The San Francisco Chronicle reported Dolly's participation in the event nearly two weeks ago, and event organizers added her name to the artist roster at the end of last week, but her involvement had yet to be independently confirmed and the actual date she would appear has not been known until now. Thanks! Although Dolly's October release Those Were The Days has landed some big-name guest stars thus far in the recording, one track will shine above all others for shear star power. Dollymania has received photos from the title cut's recording session in Nashville on July 1 showing a host of country royalty lending their voices, including previously-confirmed participant Pam Tillis as well as former duet partner Porter Wagoner and other legends such as Jack Greene, George Hamilton IV, Jan Howard, George Jones, Brenda Lee, Mel McDaniel, Jimmy C. Newman, Jeannie Seely and Billy Walker. Thanks, Ron, LeeAnn and Tony! Image at left courtesy LeeAnn Lallone. View a larger version and one additional shot of hers from the recording session here! Dolly gave an audience in Nashville a huge surprise Sunday night when she showed up unannounced to sing with mandolin hottie Chris Thile of Nickel Creek at his solo show at The Station Inn bluegrass club, CMT.com reported late Sunday night. The music channel's Web site says Dolly performed a medley with Thile consisting of classics such as "Going Down The Road Feelin' Bad," "My Long Journey Home," "Gotta Travel On," "Will The Circle Be Unbroken" and "I'll Fly Away" before they launched into two duets: "Mr. Mandolin Man" (a take on Bob Dylan's "Mr. Tambourine Man") and Johnny Cash and June Carter Cash's legendary duet, "Jackson." Read the full story here. Brad Schmidt of The Tennessean had reported in his column here Sunday morning that that Thile's publicist had hinted at a "very special" guest for his show which would be well more than worth the $10 cover charge but didn't say who it would be, noting that previous unannounced guests at his solo performances have included Bela Fleck and other members of Nickel Creek before adding: "But tonight's guest might be even more SPECIAL and a really big SURPRISE." The Country Music Association has announced that Dolly's selection for its television special from its Nashville festival this year is "Viva Las Vegas" with The Grascals. Although ABC had already announced Dolly would appear on the Aug. 2 television special CMA Music Festival: Country Music's Biggest Party, airing at 9 p.m. on the network, which tune from her four-song set during the opening night concert at the June event had not been revealed. Hazel Smith says TV's current favorite dumb blonde, Jessica Simpson, has just earned a lot of worth in her eyes. In her weekly "Hot Dish" column on CMT.com, Smith says her new-found respect for Simpson comes from her adoration of Dolly, with the star of the new Dukes Of Hazzard film saying in an interview in the current issue of Premiere magazine: "One of my favorite people in the world is Dolly Parton. She's my role model, and she can do it all." Read Smith's column here. Tennessee will welcome its 61st county participating in Dolly's Imagination Library literacy program with a kick-off Thursday in Maury County at the Kiwanis Pavilion in Columbia, Tenn., The Tennessean reported here Monday. Dolly's program, active in more than 500 communities across 40 states, sends out more than 2.2 million hardcover, age-appropriate books per year to every child in a participating community from birth to age 5 whose parents sign up. One book per child is mailed monthly free of charge and regardless of income. Ms. Cheap, a twice-weekly columnist in Nashville's The Tennessean who offers money-saving tips, on Saturday lauded Dolly's Imagination Library literacy program, saying, "I know it sounds too good to be true, but this is the real thing." She notes that 7,000 children in Davidson County, where Nashville is located, have signed up in the less than four months during which the program has been offered there. Read her column here. Dozens of readers wrote over the weekend asking about additional stops for Dolly's "The Vintage Tour" this fall after the first two non-Dollywood concerts were published here Friday night (Aug. 16 in Atlantic City and Aug. 20 in Philadelphia). As of yet, there have been no other cities or dates announced, but look for more details here as soon as they become available. Although the full list of cities and dates is not available yet, some information is starting to trickle out for the first known non-Dollywood stops of Dolly's "Vintage Tour" for the fall, Dollymania is pleased to be the first to report. House Of Blues on Friday night added to its calendar a Dolly show at the chain's Atlantic City, N.J., location for 8 p.m. Aug. 16. Tickets, to go on sale July 16 (although House of Blues members will be able to buy tickets starting at 10 a.m. Eastern Wednesday -- create your free HOB account here), are set at $128 each, and the show is for ages 21 and up only. Thanks, Solomon! And she is also scheduled to play the outdoor Mann Center for the Performing Arts in Philadelphia, Pa., at 8 p.m. on Aug. 20, although ticket information was not available as of the time of this update Friday night. I would expect additional venues to likely be released in the next couple of weeks. Dolly is currently in the process of securing other dates and cities for her own tour this fall, but as of this week promoters are still working on the final schedule, Dollymania has confirmed. Organizers of October's free admission Hardly Strictly Bluegrass Festival in San Francisco this week added Dolly's name to their official roster of artists participating in this year's concerts on the event's Web site here. Although Dolly's spokespeople have been unable to confirm yet whether she has, in fact, agreed to perform at the festival, you may recall a report linked here a little over a week ago in which The San Francisco Chronicle reported that she had been added to the show, scheduled for Oct. 1 and 2 in the city's Golden Gate Park. In other concert news, a report in The Rocky Mount Telegram in North Carolina on Friday states that Dolly and her brother will perform a yet-to-be-scheduled outdoor concert in Roanoke Rapids, N.C. The president and CEO of the private-public state economic development partnership which signed Dolly's brother Randy to open his own theater in the city in 2007 said the two Partons and "other entertainers" would perform in the show at the future site of Randy's theater "in the coming months." Read more here. After being prompted to do so by a couple of readers (Thanks, Randy and Jon! 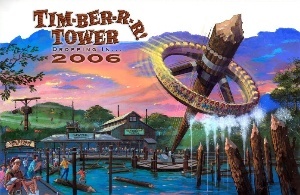 ), I was able to research the new Timber Tower ride at Dollywood and discover a few more details. The ride is one of a new breed called Topple Towers by its manufacturer, Huss, which announced the concept a couple of years back. The first one opened in May of this year at a park in Belgium and then the second one debuted a couple of weeks ago in France (another is reportedly planned for China). Their unique design, which promises heart-pounding movement without the heavy G-forces normally associated with thrill rides, has caused a great buzz over the past few months in the theme park enthusiast community, with many fans lobbying for parks in the U.S. to add them to their grounds. Dollywood's will mark the ride's first entry into the Western Hemisphere. A computer-generated video of this type of ride is available on the manufacturer's Web site here. Nashville reporter Hazel Smith said on her radio program Friday that Dolly was spotted at the Arby's drive through on Dixon Road in Nashville Thursday. While she said no one would tell her what Dolly ordered, she speculated it might have been their chicken sandwich. Thanks, Dawn! Each year, Dolly's Pigeon Forge, Tenn., theme park looks for a way to offer a new experience for next year's visitors with some sort of expansion. This year, it was a $5 million revamping of the Country Fair area, and last year it was the $7 million Thunderhead roller coaster. Well, next year, Dollywood's wooden coaster gets a wet sister and several other additions in a one-acre expansion to the Thunderhead Gap area. Anchoring the additions will be the $6.5 million Timber Tower, a 65-foot-tall rotating tower which hurls riders toward a 5,100-square-foot lake below. "We are thrilled to bring the Timber Tower, the first ride of its type in the country and one of only a handful in the world, to our Dollywood guests in 2006," Barbara Joines, Dollywood Vice President and General Manager, said in a press release issued this week. Offering a 2.5-minute ride, the 40-person spinning disc will rotate nine times a minute as it climbs to the top of the tower, which is made to appear as a partially-chopped down tree. 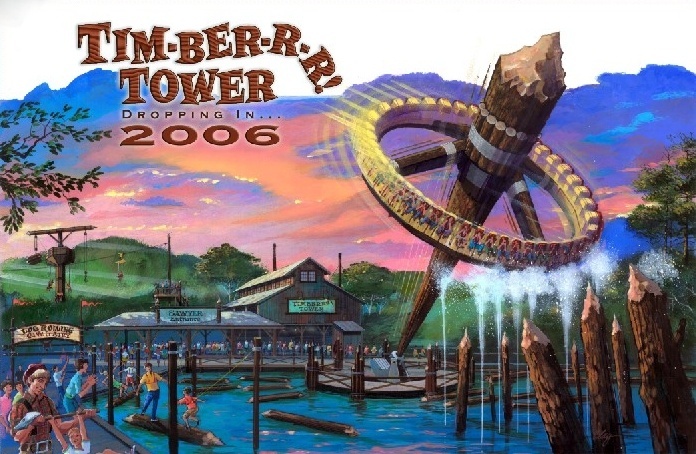 Once passengers have reached its peak, the tower will begin to swing side-to-side, tossing the disc several times at a 60 degree angle toward the water below, where water sprays will make it appear as if the riders have hit the lake surface. Continuing the lumberjack theme of the adjacent roller coaster, the expansion will also feature a new restaurant called Lumbercamp, "rustic" children's play areas and a 30-foot tower ride aimed at children, where passengers will control the twin-seated vehicles by drawing up a cable to make the car rise up to 25 feet and "free-fall" back down. Construction has already begun in the area, and the new attractions will be open for the park's 2006 season. Click on the artist's rendering of the ride at left for a larger view. The DVD release of Miss Congeniality 2: Armed And Fabulous, the Sandra Bullock comedy featuring an important Dolly cameo appearance, scored at the sales counters, with the set debuting at No. 5 (full screen version) and No. 8 (widescreen version) for DVD sales and No. 3 in video/DVD rentals in the July 16 Billboard charts released Thursday. Elsewhere on the charts, Dolly's cover of "Viva Las Vegas" with The Grascals remains steady at No. 7 in its 27th chart week on the country singles sales chart, while the CD which contains the song, The Grascals, inches down four to No. 14 in its 14th week on the bluegrass albums chart. On the same bluegrass tally, Ralph Stanley's gospel collection, Shine On, featuring the Dolly-penned title song, rebounds three spots to No. 8 in its fourth week, and Rhonda Vincent's Ragin' Live, featuring her cover of "Jolene," slides down two notches to No. 4 in its 16th chart week. George Strait's Somewhere Down in Texas debuts at No. 1 country and pop with 245,000 units sold in its initial week of release, while Toby Keith's Honkytonk University loses one to No. 2 country but rises three to No. 10 pop in its seventh week on sales of 60,500 copies. The American Idol finalists' cover of the former Dolly and Julio Iglesias duet "When You Tell Me That You Love Me" falls one to No. 6 on the pop singles sales chart in its 12th week. Thursday's Nashville City Paper praised the recently-issued compilation disc The Essential Dolly Parton as covering her vastly diverse career in which she "has excelled at traditional country ballads, autobiographical works, regional celebrations, folk-influenced sagas, heartache narratives, and even light pop entries." Read the full review here. Add Pam Tillis to the list of guest stars for Dolly's folk-rock masterpiece Those Were The Days, expected for an October release. The singer's management confirms this week she participated in a recording session for the album's title track. The two most recently sang together on "The Violet And The Rose" from Tillis' tribute to her father, It's All Relative: Tillis On Tillis, three years ago. Thanks, Vanessa and Joe! With the merger of BMG and Sony last year resulting in one company owning three-quarters of her career recordings, the vast majority of which have been out of print for decades, fans have hoped for several of Dolly's older albums to be re-issued, but no word has come yet of any such plans. Fans can let the record execs know what they think by sending their suggestions to Legacy Recordings, the Sony imprint responsible for most of its re-issues and which released last week's compilation The Essential Dolly Parton. Visit the label's contact page here and enter the artist's name, record title, your e-mail address, LP number (available on the spines and vinyl labels of the albums in your collection), year of original release and additional comments. I'd suggest contacting them periodically over an extended period, and hopefully if enough fans let their opinions be known, we could see some classic Dolly hit shelves once again! Thanks, Tony! After nearly 160 performances, the first-ever Broadway run of the play Steel Magnolias will conclude at the end of this month, producers announced Wednesday. Opening to mixed reviews, in recent weeks the production on the Big White Way in New York has played to about half-full houses, according to Broadway.com here. The live stage version of Robert Harling's originally-off-Broadway comedy-drama about the true life story of his late sister stars Delta Burke in the role of Truvy (which Dolly immortalized in the 1989 film version), Rebecca Gayheart as Shelby and Frances Sternhagen as Clairee. July's Power Source magazine, a publication of the Christian Country Music Association, is out, and Dolly action abounds. The issue includes a story on singer Kim McLean which describes how Dolly came to record the track "Angels And Eagles" on her current CD, Happy Face, and a brief also profiles the release of the compilation CD The Essential Dolly Parton. On the charts, the aforementioned "Angels And Eagles," a former top 10 on the Christian country tally, drops 24 spots to No. 44 on that chart for the month. Elsewhere, "It Looked Good On Paper," her duet with Randy Kohrs from his CD I'm Torn debuts at No. 29 on the magazine's bluegrass singles chart, and "Viva Las Vegas," her current single with The Grascals from their CD The Grascals, debuts at No. 40 on the month's independent country singles chart. The Maryville Daily Times in Maryville, Tenn., boasts of Dolly's Imagination Library in its Tuesday issue here, noting that its county, Blount, will this fall join the statewide effort to bring the literacy program to every child in the Tennessee by year's end. July 19 will see a career retrospective of Dolly pal Emmylou Harris released on Rhino Records with two Dolly tracks. The Very Best of Emmylou Harris: Heartaches and Highways, a 20-song collection, will include the Trio No. 1 single "To Know Him Is To Love Him" with Dolly and Linda Ronstadt and the song "Green Pastures," featuring Dolly harmonies. Order your copy here! Those who may have missed Dolly's headlining of A Capitol Fourth two years ago can get a glimpse of the performance this year. In honor of the 25th anniversary of the Independence Day concert on the Capitol Lawn in Washington, this year's broadcast is slated to include a "greatest hits" segment showcasing clips from years past, including part of Dolly's appearance. It airs live on PBS at 8 p.m. Eastern in most markets on Monday, although some delay it to a little later in the night; check local listings. This year's headliners are The Beach Boys and Gloria Estefan. Blogcritics over the weekend posted another review of The Essential Dolly Parton, once again praising the collection. The second reviewer gives it five out of five stars and calls it "the most thorough overview of her work available yet." Read more here. Just in time for Independence Day trips, The Huntsville Times on Sunday profiled Pigeon Forge, Tenn., and its attractions, including a lengthy portion of the article dedicated to Dollywood and its KidsFest, which continues through Aug. 7. Read it here. Dolly's sister, Stella, is the new spokesperson for the Tennessee Museum of Aviation and Tennessee Aviation Hall of Fame in Sevierville, Tenn., just next door to Pigeon Forge, The Mountain Press reported over the weekend. Take a read here. New York columnist Liz Smith appears to have jumped the gun a little in announcing some of the guest stars for Dolly's October release, Those Were The Days, recording for which is being completed this summer. Producer Steve Buckingham confirms to Dollymania that while Sean Lennon and Yusuf Islam (formerly known as Cat Stevens) have both been approached about adding vocals for the project, neither artist has confirmed his participation at this time. Also, Joni Mitchell, who was originally slated to appear on the disc, was forced to cancel her recording session due to an illness in her family, he said. David Foster plays piano on one track but doesn't sing, and Sarah McLachlan is not confirmed yet either, he added. As was noted here in Thursday night's update, Smith reported this week that all five had been confirmed for vocals on the CD in addition to already-known guest artists Norah Jones, Keith Urban and Joe Nichols. Those wishing to attend Dolly's September benefit concerts for the Dollywood Foundation better hurry, because tickets are almost gone. Both the 2 p.m. and 7 p.m. concerts on Saturday, Sept. 24 are sold out, officials confirm. Only a handful of seats remain available for the 2 p.m. and 7 p.m. shows on Sunday, Sept. 25, and they could sell out any day now. However, people who have tickets but are unable to attend traditionally turn theirs in from now through the week of the concerts, so that they may be sold to other patrons. Consequently, even after the dates sell out, fans may wish to periodically contact the park to learn if any additional seats have become available. The Dollywood performances will be part of Dolly's "Vintage Tour," which promises to showcase the cover songs she is recording for her next album as well as much of her older original material. Tickets are on sale at 1-800-Dollywood. Brother: Dolly Will Sing In N.C. Although not officially involved in the development of her brother's new North Carolina theater district, Dolly will at least perform at his venue once it opens, Randy Parton has told the press. In a story in The Roanoke Daily Herald on Friday here, the paper said he confirmed she will perform "as a guest" in the complex sometime in the future, and in Friday's The Virginian-Pilot here, he told the paper: "She (Dolly) wrote us a letter a little while back. She said she'd be looking forward to coming out and singing with us here." A profile of saxophonist Chris Hicks in Friday's The Edmond Sun in Oklahoma included a tid-bit which may be related to Dolly's plans for a musical. The article, available here, noted that Hicks "is considering a future Broadway gig with Dolly Parton, which would have him leading the horn section." Dolly is currently composing songs for two Broadway projects: a stage version of her hit film 9 To 5 and a show based on her life. Amazon.com on Friday added a page for advance ordering Brad Paisley's upcoming CD, Time Well Wasted, to be released on Aug. 16. You may recall that Paisely announced just over a month ago that Dolly would provide guest vocals on one track from the album. Reserve your copy here! New York Post gossip columnist Liz Smith earlier this week published a list of guest stars for Dolly's October release, Those Were The Days, including Norah Jones, Sarah McLachlan, Keith Urban, Joni Mitchell, Sean Lennon, Cat Stevens, David Foster and Joe Nichols. While most of those names have been previously discussed in coverage of the project, the additions of Yusuf Islam (formerly known as Cat Stevens) and �berproducer David Foster as guest vocalists was a surprise. It has been known for some time that Dolly was recording a Cat Stevens cover on the disc, but at the time he was not planned to be included as a singer since the U.S. government has refused him entry into the country. Read the note here. "Viva Las Vegas," the bluegrass cover of the Elvis Presley classic rendered by Dolly and The Grascals', registers the half-year mark with a 26th week on the top 10 country singles sales chart in the July 9 numbers released by Billboard on Thursday. The song moves up one space to No. 7 for the week, and the CD which contains it, The Grascals, re-enters the 15-position bluegrass albums chart, coming in at No. 10 in its 13th week on the chart. Ralph Stanley's gospel collection, Shine On, featuring a Dolly-written title track, tumbles five places No. 11 on the bluegrass albums chart in its third week, as Rhonda Vincent's Ragin' Live, with its live cover of "Jolene," moves up one spot to No. 2 bluegrass in its 15th chart week. After a whopping 71 consecutive weeks on the top 200 pop albums chart, Norah Jones' multi-platinum Feels Like Home, featuring the Dolly duet "Creepin' In," falls off that tally, down from No. 191 the previous week. Toby Keith's Honkytonk University remains at No. 1 country and falls six notches No. 13 pop in its six week, while Rascal Flatts' Feels Like Today remains at No. 2 country and drops two to No. 16 pop in its 39th week. The American Idol finalists' cover of the former Dolly and Julio Iglesias duet "When You Tell Me That You Love Me" slips one to No. 5 on the pop singles sales chart in its 11th week. Dolly's Imagination Library literacy program is coming to Shelby, N.C., where The Shelby Shopper on Thursday here promoted the benefits which Cleveland County should see from its implementation and encouraged residents to provide financial support. Dolly gets a note in the July 18 issue of Country Weekly magazine on newsstands this week. Included in its CMA Music Festival coverage of the events in Nashville last month is a shot of Dolly from the stage of the festival's opening night concert. Country newcomer Julie Roberts is the latest in a string of successful performers whose roots include singing at Dollywood. Her work at Dolly's theme park was noted in a story on Thursday in The Duluth News Tribune here, where she also added her adoration of Dolly herself. "I love her, I love her, I love her! If could be like anyone, it would be Dolly," she said. A couple more shots of Dolly from the KidsFest opening, this time from the VeggieTales premiere, have been added to that section of the site here. Thanks, Jamie! Dolly's brother, Randy, who is taking time off from his Dollywood show this year, on Thursday formally announced the selection of Roanoke Rapids, N.C., for an entertainment district along Interstate 95 to be anchored by a 35,000-square-foot, 1,500-seat Randy Parton Theater and a separate ocean-themed theater featuring several aquariums. Dolly and Dollywood are not involved in the venture. Read more from Durham and Chapel Hill's The Herald Sun here.